So in keeping in step with the flood of horror remakes these days, I thought I’d say a little something about The Children. I remember seeing the original version from 1980 alternative title is The Children of Ravensback. I remember finding the film really disturbing back then for obvious reasons. Dead children creep me out even in small doses. I’ve always reconsidered watching it again, but could never bring myself to do it. Now, thanks to the heads up from (http://ellabellareviews.blogspot.com/2010/11/children-2008.html) I see the remake in 2008 includes a cat being killed. That has always been the one criteria for avoiding a horror film. If an animal is brutally tortured or killed, I just can’t bring myself to submerge my attentions into the story. I actually edited out the very long segment in Argento’s Inferno which was the follow up to his masterpiece Suspiria, in The Three Mothers trilogy. I won’t even detail here what happens in Inferno because it harms me to even think about it. But wanting to have the film in my library I took it upon myself to edit out the portion with the horrible cat killings so I could some day, revisit the film. I love Curtis Harrington dearly, but I’ll never be able to watch The Killing Kind with John Savage again, because I had a Himalayan Persian that I rescued whom I fiercely loved and the film shows a Persian cat killing. Hated Pet Cemetary wouldn’t watch it after the first fifteen minutes I was subjected to. So many films I can’t name them all. Bug(1975)The Andromeda Strain 1971 fantastic film, but there’s a scene in the beginning,geez,Carpenter’s remake of Howard Hawk’s The Thing and the truly edgy DeathDream 1974.The irreverent Alice Sweet Alice was great except for that sociopath little brat who kills the sweaty, grotesquely obese pedophiles kitten. Horrible scene. Love the film, but horrible scene. And as fascinated as I was by Jorg Buttgereit’s The Death King, there is still controversy as to whether or not he actually killed the cat for real in Nekromantik, a film I might have really liked to see, but I’m not supporting any filmmaker who brutally murders a cat on film for no apparent reason. I can’t even talk about Lucky McKee’s May which I think is brilliant, and although Larry Fessenden is an amazing contemporary film artisan, who had a vision with his cautionary tale called No Telling, I’ll never be the same after watching that film. Same with You’ll Like My Mother, 1972 which would have been a great 1970’s made for tv film with Patty Duke, with the exception of a sad reference to Siamese kittens and one beautiful little Siamese character actor who succumbs. I watched the concrete floor of the movie theater most of Rob Zombie’s remake of Halloween. He just had to throw a dead cat and a poor little rat in there for bad measure. So many potentially interesting films, like The Ring. I bet horse lovers everywhere were saddened or even enraged like me. I loved The Orphanage but I had to do the hands over the ears, humming and close my eyes, because of the kittens. As a little monster girl I even worried about the little dog in The Blob back in 1958. I also send out reconnaissance before I attempt to watch a new film because I need to know if an animal will be tortured as a senseless ingredient to fill the plot. I am a huge worshiper of felines. Done my share of rescue and activism and am a fierce lover of the horror genre, but I draw the line when they kill animals in films. In my opinion it contributes nothing to the substance of the plot or add anything significant to the narrative but to add shock value. We all know that a majority of serial killers start out by hurting small animals. Do I need to see it re enacted in order to stress the violent nature of the antagonist. In real life animals have no voice, and need us to advocate for them. Why perpetuate the image of cruelty toward a defenseless creature for the sake of an extra bit of extremism, or novelty? Alot of us horror fans are also huge dog and cat lovers as well, so I wish these film makers would give us all a break and stop adding these damaging images to their work and spare us the heart ache! 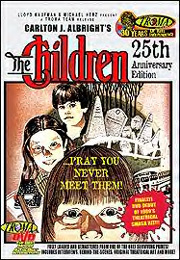 I don’t plan on watching The Children 2008, so I won’t be able to review it. I just wanted to put it out there, that remakes annoy me, harming animals riles me. dead creepy children effectively creep me out especially if it’s done well. And now back to the reference to the black finger nails and severed hands. One of the memorable things that remain torched in my over-imaginative brain are the little children from the original film with their tiny hands emblazoned with grotesquely blackened nails. And the only way to stop these little cadaverous kiddies is to hack off their hands. Next to killing animals, severed hands make me morbidly preoccupied, as I am also a pianist singer/songwriter, who loves her hands dearly. Another film that integrates severed hands as the driving motif is the taut thriller, When The Bough Breaks 1994 starring Ally Walker, Martin Sheen and Ron Perlman. As disturbing as this was for me to experience, the film was really well acted and the plot was quite original so I was able to hold down my breakfast. When it comes right down to it, I’d rather see a pair of hands die than an animal! Posted on December 4, 2010 December 4, 2010 by monstergirlPosted in Contemporary Film &, Directors and Filmmakers, UbiquityTagged anti-animal cruelty in horror films. The Children 2008 remake and 1980 Dario Argento, black fingernails. dead creepy kids. toxic mists and bus loads of kids. zombie kids, Larry Fessenden, Lucky Mckee., Patty Duke. Curtis Harrington. You, Rob Zombie. Naomi Watts Halloween, severed hands, The Ring, You'll Like My Mother..